INTEGRATED understands the importance and time sensitivity of budgets. Over the years, INTEGRATED has consistently published survey results on time - participation is now open for the 2014 National Healthcare Leadership Compensation Survey and results will be available on August 29. “Healthcare organizations have almost no margin for error when it comes to budgets, and it is only getting tougher in 2014,” Kevin Talbot, senior vice president & practice leader for INTEGRATED, said. 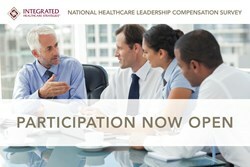 Healthcare organizations are invited to participate in the INTEGRATED Healthcare Strategies 2014 National Healthcare Leadership Compensation Survey. Participation will be open until May 9, 2014. This survey includes executive, director, and manager-level positions to create a comprehensive source of leadership compensation data. In 2013, INTEGRATED Healthcare Strategies conducted one of the largest leadership surveys in the United States with a record number of 1,350 participating healthcare organizations. INTEGRATED understands the importance and time sensitivity of budgets. Over the years INTEGRATED has consistently published survey results on time. The 2014 survey results will be available on August 29. With compensation and budgets continuing to be a challenge, especially with declining reimbursements a stark reality for many organizations, this is a topic that isn’t going away in healthcare. INTEGRATED has experts and primary research data to share with industry media. Please contact Christy Boswell, survey manager, at christy(dot)boswell(at)ihstrategies.com if you’re in need of an expert or data to help complete a story. For more than 30 years, INTEGRATED Healthcare Strategies has provided consultative services and people-based solutions to clients across the healthcare spectrum, including community and children’s hospitals, academic medical centers, health networks, clinics, and assisted-care providers. Our expert consultants and nationally recognized thought-leaders help organizations achieve their business goals by ensuring top talent is attracted, retained, and engaged, while measuring and maximizing human and organizational performance. With tailored solutions that extend well beyond single services, INTEGRATED offers the knowledge, guidance, insights, and alignment that organizations need to not only survive the rapidly changing healthcare environment, but to succeed in it. Exclusive to Healthcare, Dedicated to PeopleSM.